Step1. 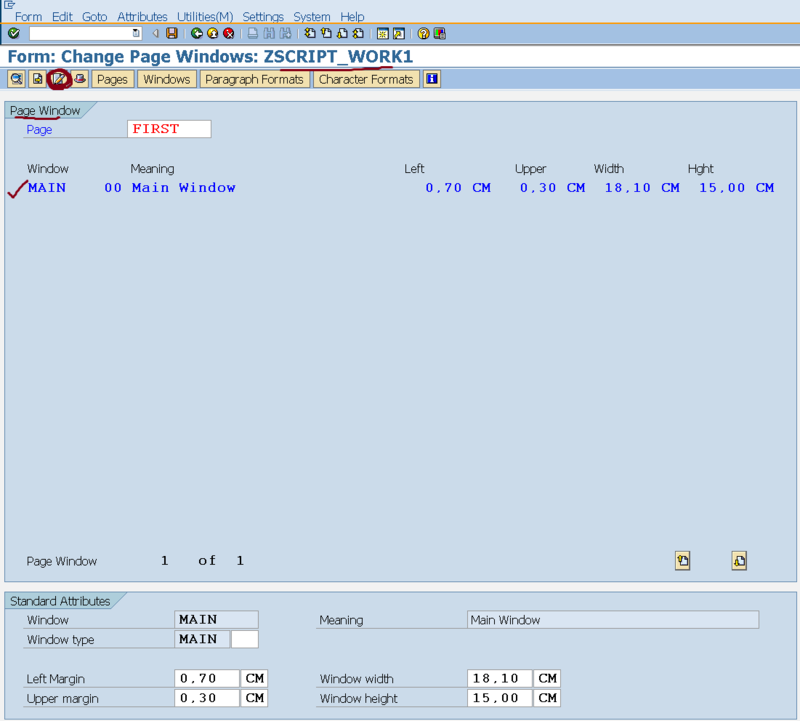 Go to the Script, page Windows, Select the MAIN window and Click on the High Lighted button. Step2. So we have the Previous text as shown. 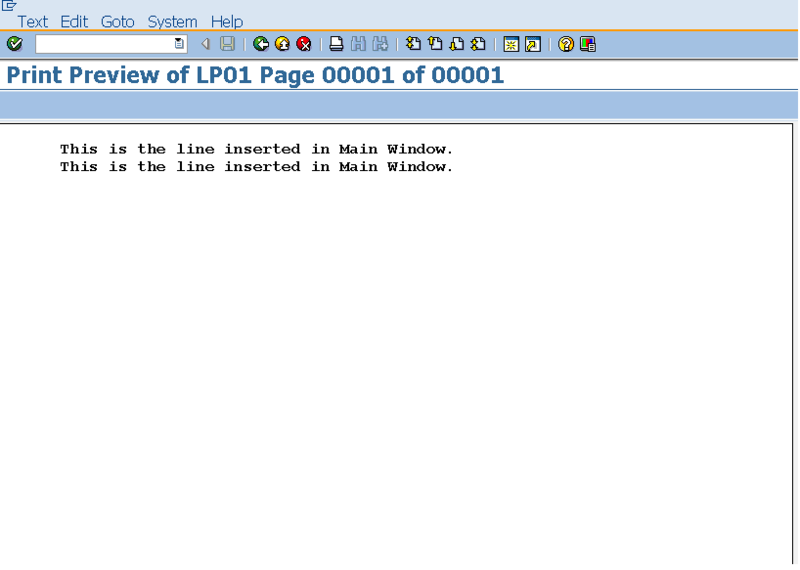 Click on the End of the Line and Hit Enter key from the key board. Step3. 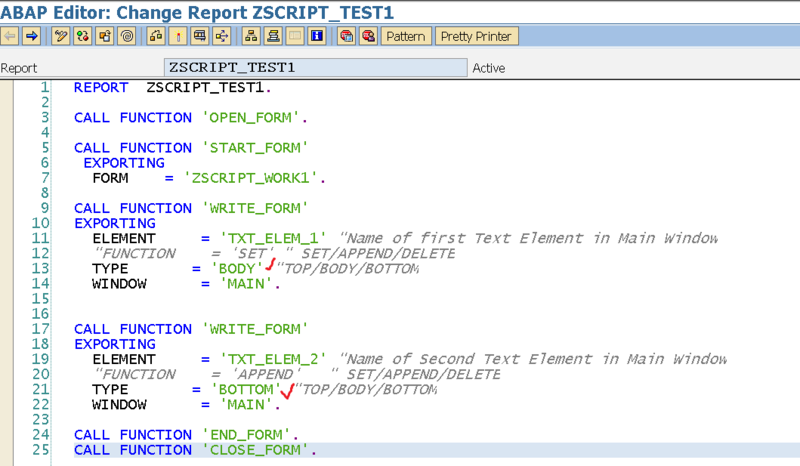 From the left side F4 value, choose /E for text element and give a text element name . 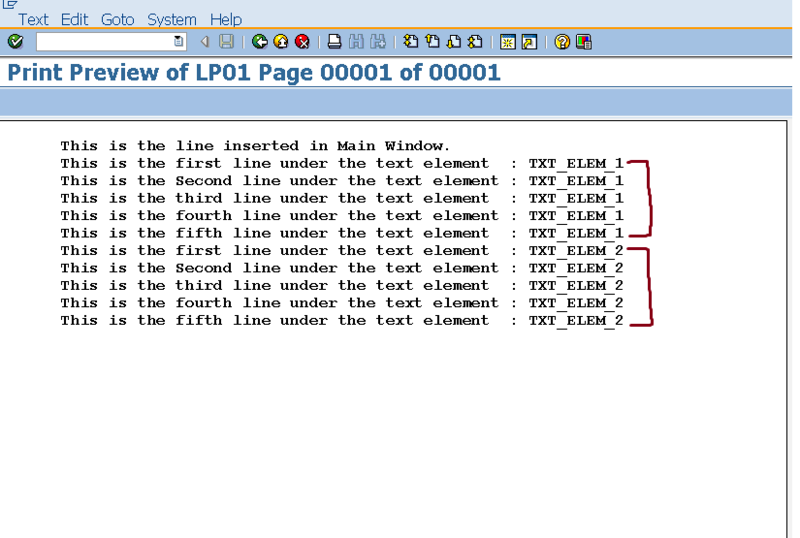 In this case the text element name is ‘TXT_ELEM_1’ & under that write some line. 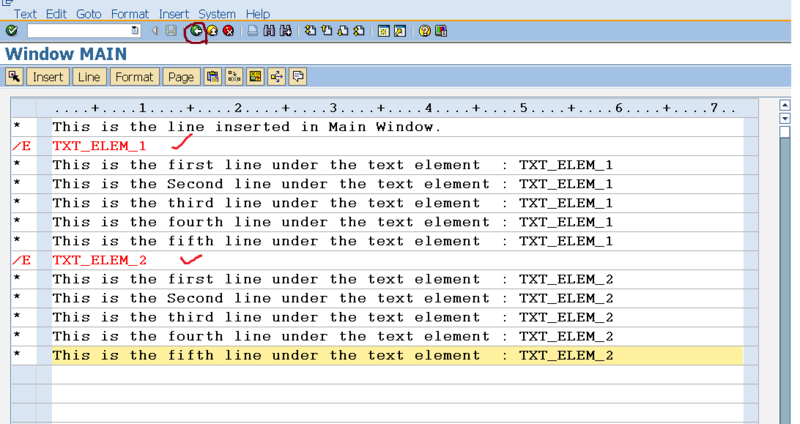 These lines are come under text element ‘TXT_ELEM_1’ . Go back. Step6. Click on the Print Preview. Step7. So here we have the Output without the text element lines. Step8. 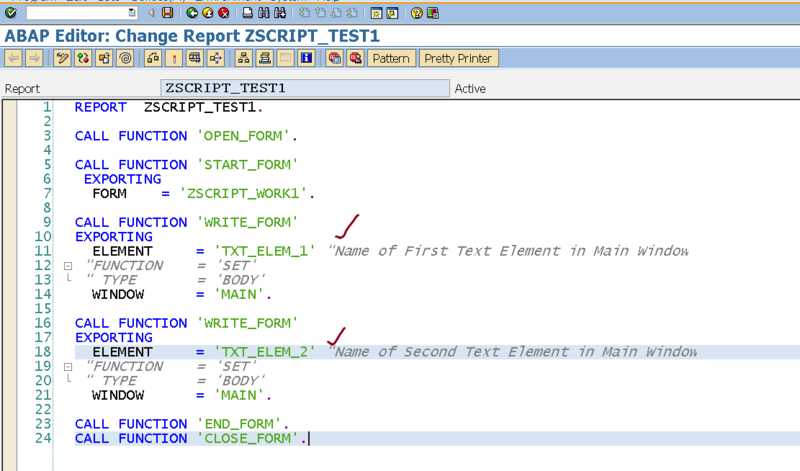 Now in the WRITE_FORM pass the element name : TXT_ELEM_1 and execute the program. Step10. Let’s add one more text element to the form. Choose the window name and click on the High lighted button. Step11. Add one more text element : TXT_ELEM_2 and add some more lines under it. Go back. Activate the form. Step12. 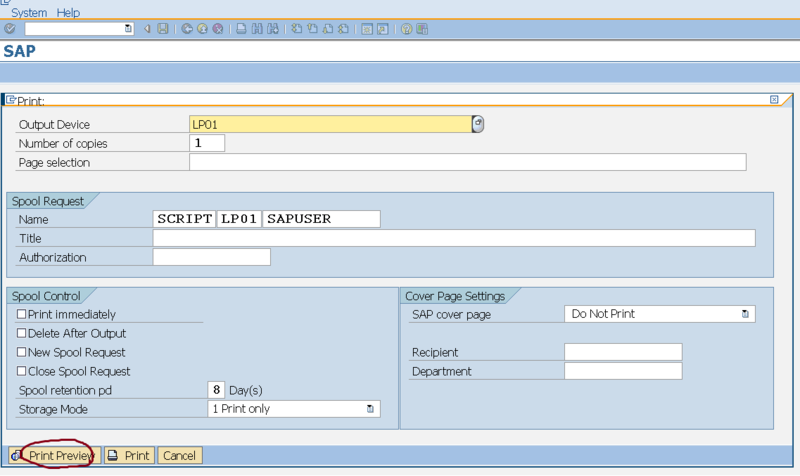 Go to the program and execute it . 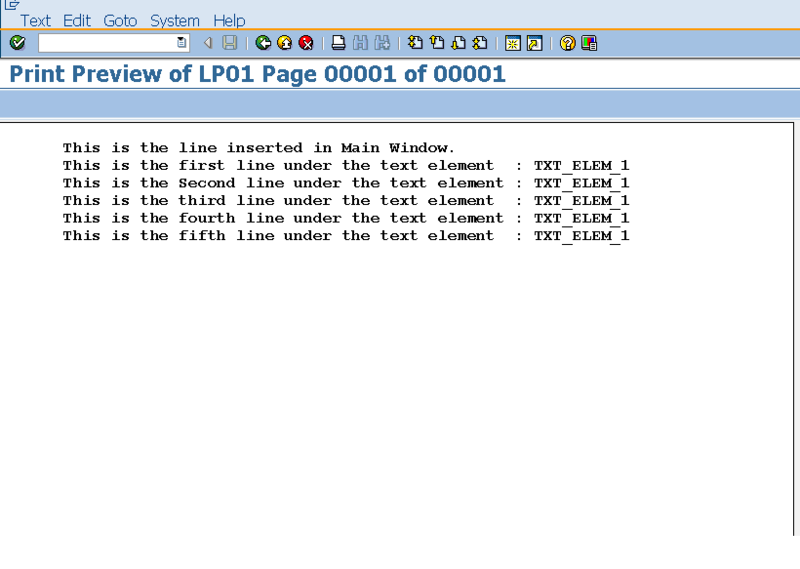 Here we have called only text element TXT_ELEM_1. Step13. We have the below output. 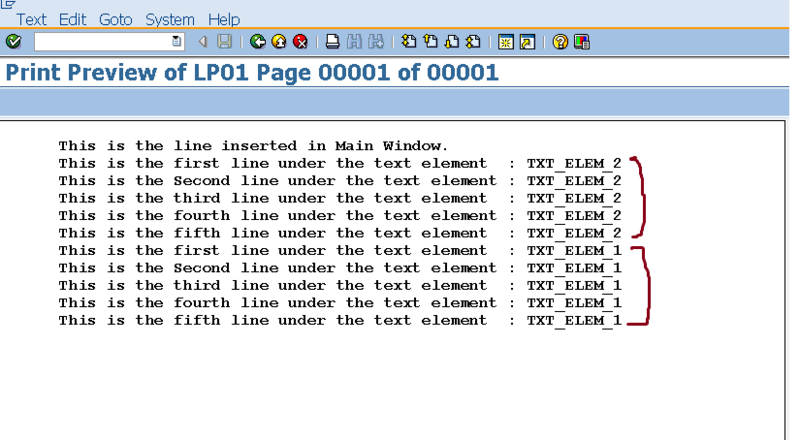 The O/P only contains the lines under text element TXT_ELEM_1. Step14. 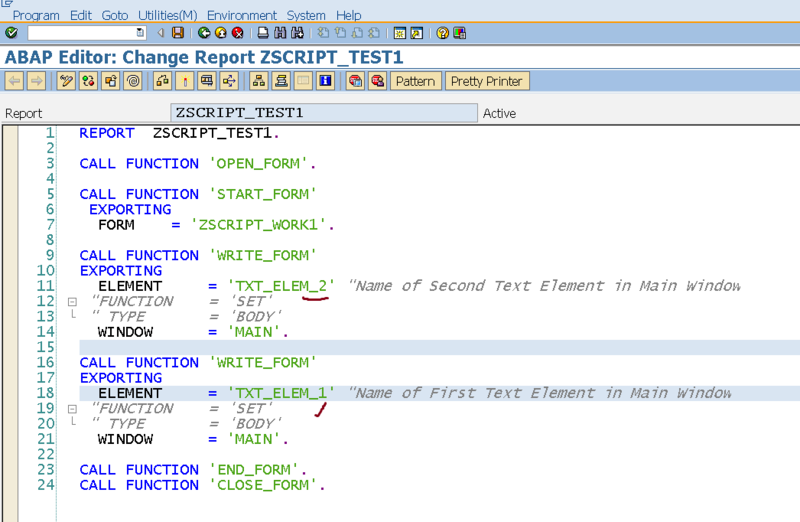 In the driver program, Call the FM ‘WRITE_FORM’ again and pass the text element ‘TXT_ELEM_2’ . Activate the program and execute it. Step15. So here we have all the O/P. Step16. 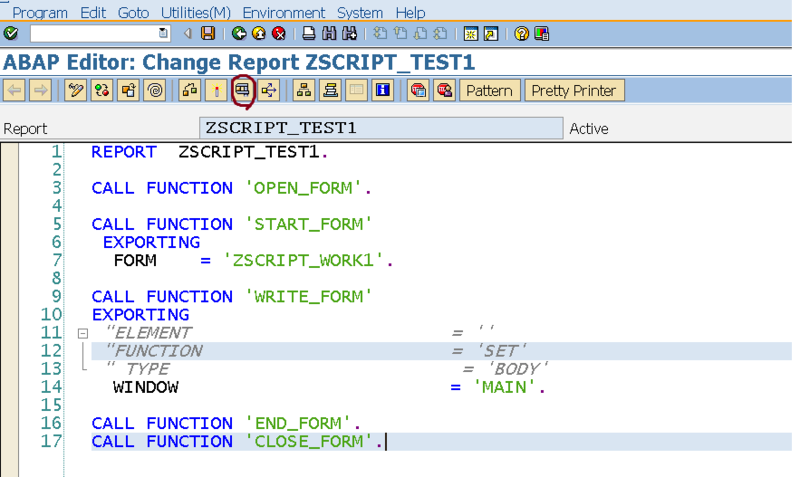 Call the text elements in different order and observe the output. Step17. Here we have the O/P. Step18. 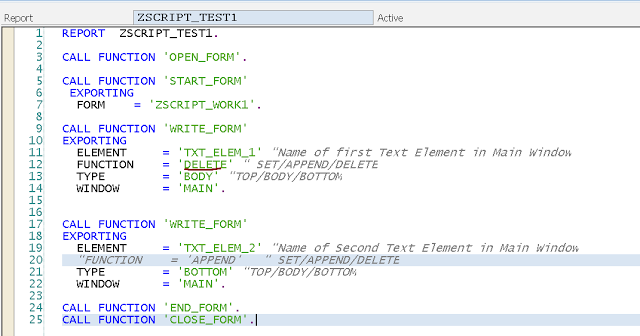 In the second call of the WRITE_FORM pass TYPE = BOTTOM and execute the program. Step19. 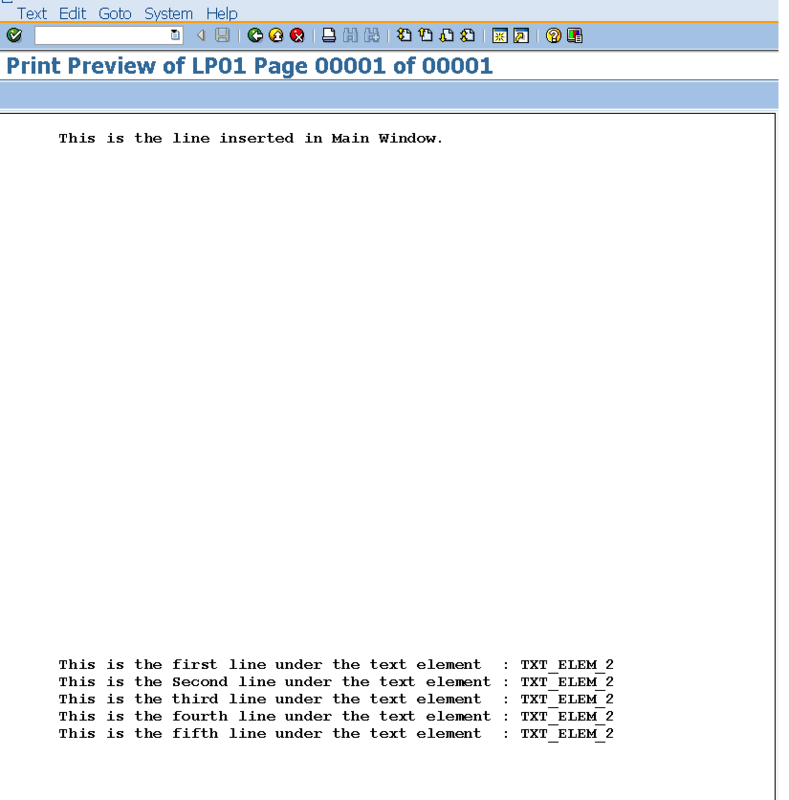 So with TYPE = BOTTOM , the line under text element TXT_ELEM_2 appears in the bottom of the page. Step21. 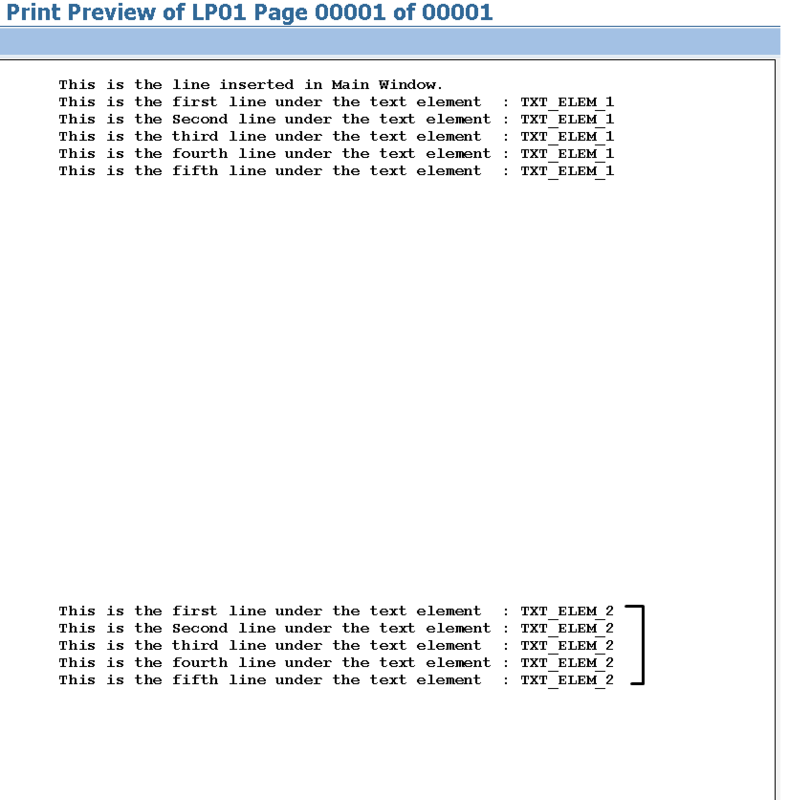 So the lines under the text element : TXT_ELEM_1 is not printed.